Deadly fighting raged between armed tribesmen and security forces on the streets of Sanaa Thursday, sending thousands of residents fleeing and closing the Yemeni capital’s airport, witnesses said. Medics said bodies were lying in the streets of Al-Hasaba neighbourhood, bastion of powerful tribal leader Sheikh Sadiq al-Ahmar, where the fighting erupted on Tuesday after a truce broke down. Tribal leaders meanwhile said thousands of armed tribesmen were on their way to Sanaa to boost Ahmar’s forces, but had been stopped at a military post 15 kilometres (nine miles) north of the capital, where clashes broke out. 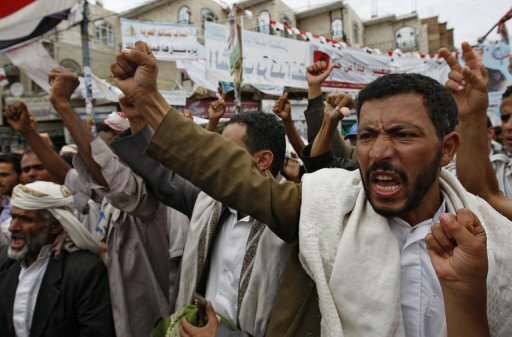 According to one tribal leader, the armed tribesmen “want to enter Sanaa to back their leader” Ahmar, who heads the powerful Hashid tribal federation and who has thrown his weight behind protesters demanding the fall of President Ali Abdullah Saleh. Witnesses said a warplane flew at low altitude breaking the sound barrier in Ahmar’s birthtown of Khamr, 80 kilometres (50 miles) north of Sanaa, in an attempt to intimidate the tribesmen. Officials said Sanaa’s airport, about 10 kilometres (six miles) from Al-Hasaba, had been closed on Thursday with all flights diverted to the southern city of Aden. Heavy fighting raged in Al-Hasaba through the night and into Thursday, in which at least 15 people were killed, according to medics and witnesses. Among the victims was a seven-year-old girl, who died of her wounds after she was hit by a stray bullet, said a medical official at Al-Jomhoreya hospital in Sanaa. Saleh’s “special forces”, who have received special foreign training in the fight against terrorism, have also joined the fighting, said residents, who described the overnight clashes as the “most violent” of the past two days. Running street battles on Wednesday killed 47 people, medics said on Thursday, updating a previous toll of 39. “The bodies are still scattered in Al-Hasaba and ambulances cannot reach it due to the dangerous situation there,” said a medical official. A 70-year-old resident, Mohsen Sinan, said he and 30 members of his household were trying to flee Sanaa along with most other residents. “Sanaa is deserted now and if these battles continue Yemen will be finished,” he said. Fighting in the capital broke out on Tuesday after a truce collapsed between security forces and tribesmen who have taken control of public buildings across the capital. The truce was announced May 27, after a week of fierce clashes that erupted when Saleh warned of a civil war as he refused to sign a Gulf-brokered plan for him to give up office as demanded by pro-democracy protesters. Many shops remained shut in the impoverished country’s capital and there were long lines at petrol stations as residents who remained complained of water shortages and power cuts. US Secretary of State Hillary Clinton said Wednesday Yemen’s conflict will not end unless Saleh and his government make way for the opposition to begin a political transition. And in a potential for a further escalation of violence in the Arabian Peninsula country, previously unarmed protesters have resorted to carrying weapons in the flashpoint city of Taez, where they clashed Thursday with security forces, witnesses told AFP. The witnesses said the clashes took place near the presidential palace and near a post held by the Republican Guard, an elite army unit loyal to the embattled Saleh and led by his son Ahmed. A crackdown on protesters in Taez since Sunday has left more than 50 people dead, according to the UN human rights office. Protesters who have turned out in their tens of thousands across the country since late January to demand Saleh’s departure have generally staged peaceful demonstrations, which have inevitably been dispersed with violence by security forces. According to an AFP tally based on medics’ reports, more than 180 protesters have been killed since January and thousands wounded.